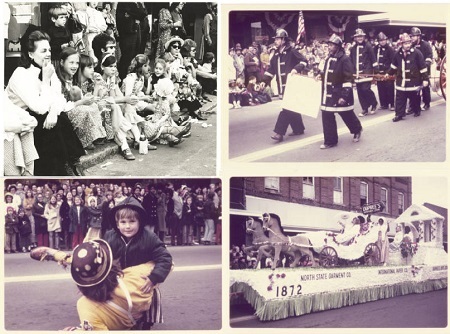 A collection about the 1972 Farmville Centennial Celebration, from the Farmville Public Library, is now available at DigitalNC.org. 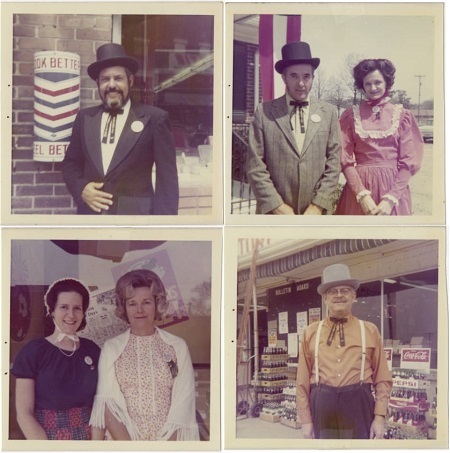 The collection includes over 100 photos of Farmville residents on the day of the celebration, including librarians, principals, lawyers, policemen, doctors, and local business owners dressed in historical clothing to commemorate the special event. Also pictured are Congressman Walter B. Jones and First Lady Mrs. Pat Nixon. The photos were taken all around Farmville’s downtown, mostly along Main Street in front of businesses and buildings still standing today. There are photos of the celebration’s parade, including the crowds, floats, and parade participants. The collection also includes Farmville’s 100th Anniversary book, which provides the 100 year history of the town, including its first settlers and collected histories of Farmville’s businesses, politicians, citizens, churches, railroads, and schools. The book highlights the Centennial Celebration’s planning and activities, providing more photos and a description of the events. The book focuses on how the town was developed and how it has grown over the years, with many images of and much more information about the people essential to its history and future. We’ve recently completed digitization of issues of the Badin Bulletin from 1918-1920, from the collections of the Stanly County Museum, which give a interesting glimpse into life in a factory town in the early 20th century. The town of Badin was formed in 1913 by a French aluminum company to house workers for a large plant being built on Yadkin-Pee Dee River. The outbreak of World War I derailed the French effort and the plant was purchased by the Aluminum Company of America (ALCOA). Although the town retained some of its original French influence, the collection of small houses grouped near the factory resembled the textile mill villages that were then prevalent throughout Piedmont North Carolina. When the United States entered the World War, local demand for aluminum was high. As the factory expanded, so did the town. 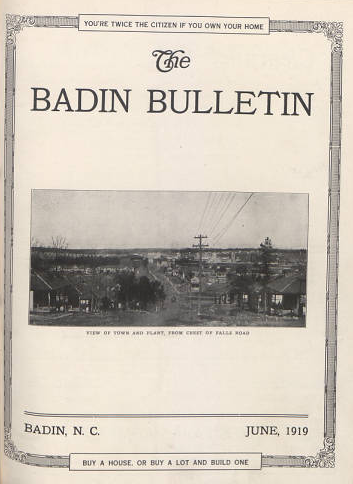 The Badin Bulletin documents civic and social life in the community from 1918-1920. It’s definitely a company paper — there are no stories about labor unrest or worker dissatisfaction — but it still provides an interesting look at the lives and activities of the workers. Much of the paper is devoted to news of the employees and their families, especially marriages, births, and deaths. There is a lengthy social column noting the visits and illnesses among the community and most issues are interspersed with patriotic articles and features about the factory itself. Most issues also include news from the local African American community. Like much of the South during this time, Badin was strictly segregated by race. The editors of the Badin Bulletin presented stories about the local “Colored Village” as if it were a source of pride for the company. Several issues include photos of houses and public buildings in the African American section. This may have been part of an effort to attract more African American workers to the factory. Badin remained a small community closely tied to the aluminum plant until 2010, when Alcoa announced that the factory would be closed and the property redeveloped for future industrial use. Badin celebrated its Centennial earlier this year. One of the more recent items we’ve digitized from the Stanly County Museum is the “Copy of Robert E. Lee’s Farewell Address and Parole Slip of Confederate Soldier E. S. Swaringen, 1865.” It’s a self-explanatory title, and despite the historic nature of Lee’s address the Parole was probably of equal or more import to Swaringen. The well-worn parole pass is pictured below. Dated April 10, 1865 at Appomattox Court House, Va., the pass reads: “The Bearer, Sargt E. S. Swaringen of Co. “I” 52nd Regt. of N. C. D., a Paroled Prisoner of the Army of Northern Virginia, has permission to go to his home, and there remain undisturbed.” It is signed S[amuel]. Lilly. After Lee’s surrender, over 28,000 parole passes like this one were given out to Confederate soldiers who agreed not to fight — who would give up their arms and proceed home. The blank passes were printed in the field, the operation being directed by Major General John Gibbon who recalled the difficulty of producing so many in such a short period of time. It’s interesting to think about printing logistics compared with an event as momentous as the end of a war. Printing and filling out those passes would be like supplying every person in the city of Sanford NC with a small form within 24 hours. E. S. Swaringen, the bearer of the pass, was Eli Shankle Swaringen or Swearingen (1836-1913) of Stanly County, North Carolina. The Swaringen family was and is prominent in Stanly County; William Swaringen was one of the first justices of the peace. During the Civil War, the 52nd Regiment, of which Eli was a part, was organized on 22 April 1862 near Raleigh. You can read a more extensive description of the Regiment’s activities in Volume 3 of the Histories of the Several Regiments and Battalions from North Carolina, in the Great War 1861-’65, p. 223 [271 online]. Swaringen and family are buried at Randall United Methodist Church in Norwood, North Carolina, and his tombstone, albeit slightly hard to read, is pictured here. You can see more Stanly County Museum items at digitalnc.org. From the Western Democrat, 1854. The Western Democrat, a Charlotte newspaper, is now online with issues dating from 1853 through 1868. A weekly paper, it is interesting in that it does not contain much local news or even information which would be recognized as news by modern readers. The front page includes such stories as “A Clever Anecdote–The Emperor and His Daughter” which is indeed a story as well as reprints from other newspapers. Generally four pages in length, the last two contain the most local content which is in the form of advertisements. Ads for “negroes wanted,” “negroes to hire,” and “negroes for sale” are common, such as in the the December 6, 1859 issue. Also frequent are advertisements offering rewards for runaway slaves. 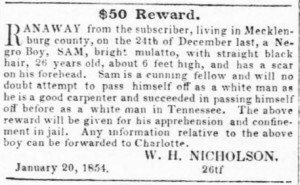 On the same page of the March 31, 1854 issue, a $50 reward is offered for the apprehension of a 26-year-old man while a separate ad offers the same amount for the apprehension of a thief who stole fifteen turkeys. With the start of the Civil War in 1861, the newspaper shifts focus and prints stories almost exclusively related to the war effort. Lists of North Carolina killed and wounded are included as are descriptions of battles, discussions of the state’s defenses, and reprints of speeches and general orders. Though lacking in local content, the Western Democrat provides insight into the important news during the 1850s and 1860s and gives the perspective of a Southern town on the Civil War. Firestone News, a company newspaper produced by Firestone Textiles, formerly a division of Firestone Tire & Rubber Company, has been digitized and is now available on DigitalNC. The publication, which runs from 1952 through 1971 and was bimonthly and later monthly, is specifically for the Gastonia plant. While stories about the company are included, the majority of the content is related to events and employees in Gastonia. Each issues contains a “News in Brief” section divided by plant departments such as carding, spooling, and winding, which reports news on members of those departments. Typical announcements include births, deaths, illnesses, vacations, sons home on military leave, and visiting guests. The paper also reports on company sports leagues, including bowling, baseball, and the fishing club. 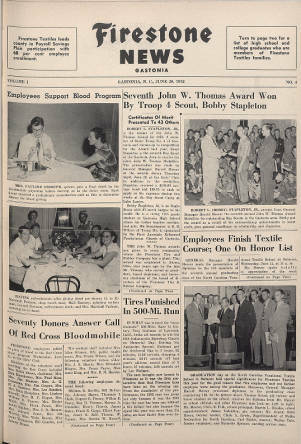 In later issues, service anniversaries were published, along with photos of those employees with twenty-five years or more at the plant. The Firestone News should be of particular interest to genealogists researching former employees of the plant as well as those who would like to know more about the culture of a North Carolina textile mill in the second half of the twentieth century. The Firestone News has been published online in partnership with the University of North Carolina at Chapel Hill North Carolina Collection and UNC’s Digital Innovation Lab. Scrapbooks and photographs from the Durham County Library documenting the early life and career of college tennis player, Irwin Holmes, are now available at digitalnc.org. Born in Reidsville, N.C., Holmes enrolled at North Carolina State University in Raleigh, N.C. in 1956. He graduated with a degree in engineering in 1960 and went on to work in the technology sector. The scrapbooks were put together by Holmes’ mother and include childhood photographs and memorabilia from Holmes’ tennis career. Holmes made history as the first African American to earn an undergraduate degree from North Carolina State University as well as being the first African American athlete at the University. He excelled at tennis and joined the Wolfpack tennis team in 1958, eventually becoming co-captain. The tennis team embraced Holmes in a time when some states still prohibited African American athletes from competing with white athletes. John Kenfield, the NCSU tennis coach, would not take his team to schools that would not allow Holmes to play. Other southern colleges soon began to recruit and include more African American athletes. Clinton W. Toms (1868-1936) graduated from the University of North Carolina at Chapel Hill at the age of 21 and was a school principal prior to holding the position of superintendent for Durham schools from 1894 to 1897. Known as a progressive educator and philanthropist, he revamped the administration and arrangement of the graded school and helped to found the Durham Public Library in 1896. He introduced a compulsory manual training course to the curriculum and also reorganized the high school curriculum into subject departments. His efforts to secure funds to provide classroom materials brought him in contact with the Duke family. In 1897, he left the field of education to join the American Tobacco Company. 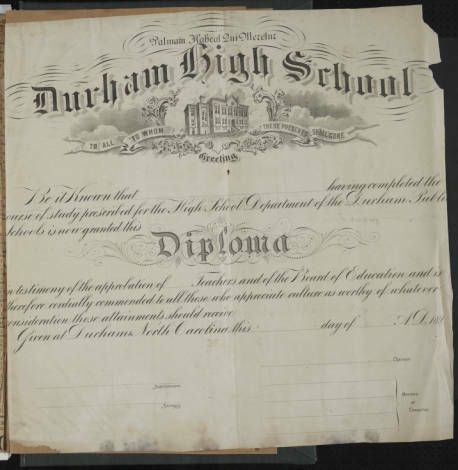 This scrapbook documents Durham’s education system during Toms’ service as superintendent, primarily through newspaper clippings. Also included are school exercises, correspondence, and printed material. The Toms Scrapbook is shared online by the Durham County Library.